This top is perfect for transitioning into fall. I am seeing sleeveless sweaters everywhere. I love how long this one is in the back. It would be so cute with leggings and boots. I purchased these jeans during the Nordstrom Anniversary sale. And they are finally back in stock! I love the rips in them and for $56 you can't go wrong. I hope you al have a great weekend. Thank you so much for reading. Wonderful outfit, so simple, chic and perfect for mommy on duty! 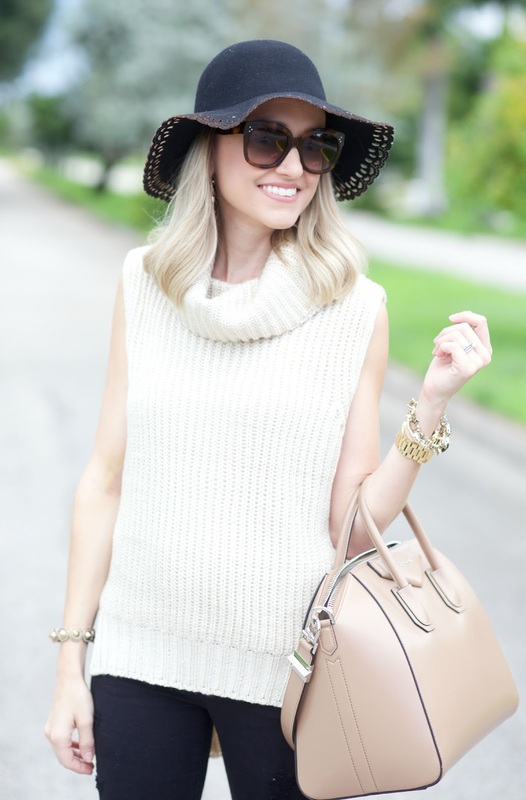 Love the sleeveless sweater look! Loving the contrast in this outfit. Those shoes are fabulous!!!! Gorgeous! So simple and classic. Love those oversized sweaters, they are also perfect to wear as maternity clothes, since you can wear them after having the baby! Love this! The shoes are perfect! Love this look, Jade! Such the perfect transitional look! Such a great early fall look! I love the detailing on the hat! Love the sweater and your hat!